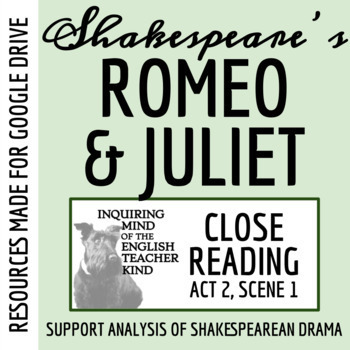 This editable close reading exercise features 7 text-dependent, higher-order questions, helping students improve reading comprehension of Shakespeare's Romeo & Juliet (Act 2 Prologue & Act 2, Scene 1). By engaging in this exercise, students will read to identify what the text says explicitly and implicitly, apply literary devices, and interpret figurative expressions. 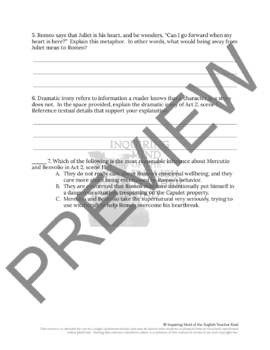 An answer key is included, as are Word Document, Google Document, and PDF versions of the assessment. Citing textual evidence in support of a claim: "Now Romeo is beloved, and loves again." Citing textual evidence in support of a claim: "Now old desire doth in his deathbed lie." Discerning meaning: "Being held a foe, [Romeo] may not have access to breathe such vows as lovers use to swear…"
Discerning meaning: "But passion lends them power, time means, to meet, / Temp’ring extremities with extreme sweet." Analyzing author's choices: the use of metaphor to indicate how incomplete Romeo would feel without Juliet nearby. Applying literary devices: dramatic irony. Drawing rational inferences: Mercutio and Benvolio's sincere concern for the well-being of their friend. This resource aligns well to Adolescent Literacy Project teaching principles. I recommend using these worksheets as the basis for small-group discussions. 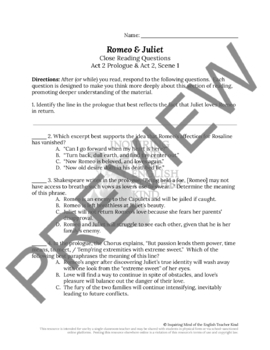 Through these discussions, students decode Shakespeare's language and pose/respond to questions relating to plot, broad topics, and character development, demonstrating an ability to analyze how complex characters transform and advance the plot and themes by applying logic and citing compelling, meaningful textual evidence. They will also evaluate their peers' reasoning and use of rhetoric to advance claims, clarifying or challenging unclear ideas. Using this resource for structured guidance, students, ultimately, will present information, conclusions, and supporting textual evidence clearly, concisely, and appropriately, thereby helping their peers -- and teacher -- comprehend their thinking. In the role of facilitator, I observe my students becoming more consistently engaged with the novel and taking greater ownership of their learning. In addition to helping students gain deeper understanding of the material and greater confidence in their ability to read harder texts, this resource was designed to prepare students for ACT-style questioning. Click the 'PREVIEW' icon beneath the thumbnail to preview the entire resource.